I took some time to do a little informal interview with my kids. I asked them what they thought about homeschooling and what they enjoyed most about homeschooling. I also questioned them on their favorite subjects in our homeschool. I thought it would be fun to see their answers! 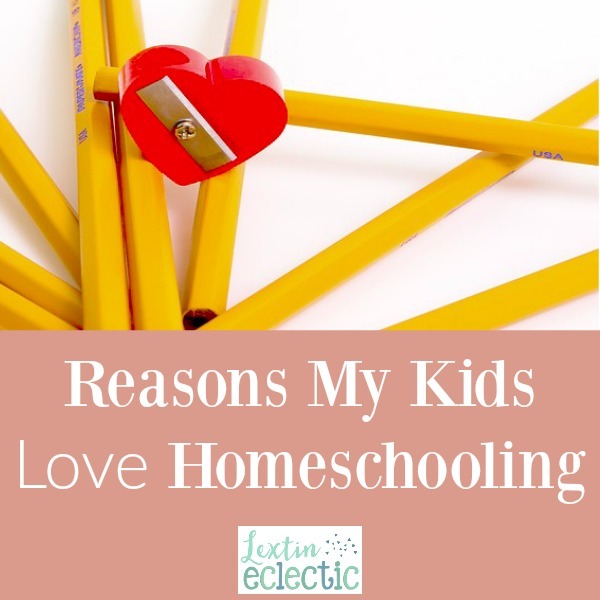 Have you ever interviewed your kids to see what they thought about homeschooling? Their answers might surprise you! Of course, my kids have always been homeschooled so they can’t compare their school experience with that of a public or private school education. However, it was fun to see homeschooling through their eyes. Curly (4th grade, age 10) said that she liked homeschooling because she feels things are faster. She feels like she is able to get more done in a shorter amount of time. Time is not wasted in our homeschool. This means that she gets extra play time which is her favorite reason for homeschooling. She enjoys extra time to follow her own interests and her own pursuits. Curly listed history as her favorite subject because she loves reading books about people and places long ago. History captures her imagination and transports her to other lands and times. She can never get enough of our history reading time. Tiger’s favorite subject is also history. I’ll admit that he surprised me with this one. I thought for sure he would choose math. However, he loves the books about famous people, battles, and far-off places. He would sit contentedly for hours while we read history books together. Bee (1st grade, age 6) said that she liked to homeschool because of the game time. Each day we try to play a game or two with the younger girls and the kids often play games together in the afternoon. Having the extra time for games is her favorite thing about our homeschool. Bee decided that she did not have a favorite subject. Somehow I’m not surprised. She is my dreamer, out-of-the-box, creative thinker, who learns by doing and moving. I think if field trips or outside play was considered a “subject” those would be her choices. Ladybug (PreK, age 4 – almost 5) said she loved the reading. We spend time reading together every morning and she loves reading Bible stories and picture books with me. It’s fun to know that is her favorite part of our homeschool. She’s also been asking to learn to read lately and has enjoyed learning letter sounds. She can’t wait until she reads a book on her own! Little Ladybug gave Bible as her favorite subject. She most enjoys sitting curled up on our recliner reading Bible stories together from one of our many story book Bibles. Then she insists I ask her questions about the story so she can answer me with her narrations. She’s my Bible scholar. Punkin (Totschool, age 3) said, “I just like it.” So she might not have any idea of how our lives are different because we homeschool, but hopefully she will understand more as she gets older. However, it was encouraging to hear her say that she does like our homeschool lifestyle. I hope she continues to like it even as she starts doing more actual school with me. Punkin said she loved the book about horses which is our current science read aloud. I read short picture books about different plants and animals for science with both her and Ladybug. Apparently this is her favorite part of our homeschool day. I think she loves the bright pictures of the different animals. So, while their answers weren’t overly detailed, they were insightful. My kids are happy with our decision to homeschool and recognize that they are given time for games and for play. Their time spent playing with me and their extra free time are their favorite parts of our homeschool. I hope that this time gives them cherished memories as they grow older.